As a jewelry designer, I often refer back to history for inspiration. Sometimes you have to wonder what our mommas were thinking though, as in "what was up with those gloves"? Oh, but check out the pearls. What do you wear with your 2016 wardrobe staples? Of course you have the all purpose white blouse, black slacks, dark blue jeans, a pencil skirt and flip flops. But do you have pearls? How many colors of pearls do you own? What about different sizes and textures like the nucleus pearl? Or a thin strand of coin pearls on a bracelet with your favorite charm dangling off? Do you combine pearls with anything else? 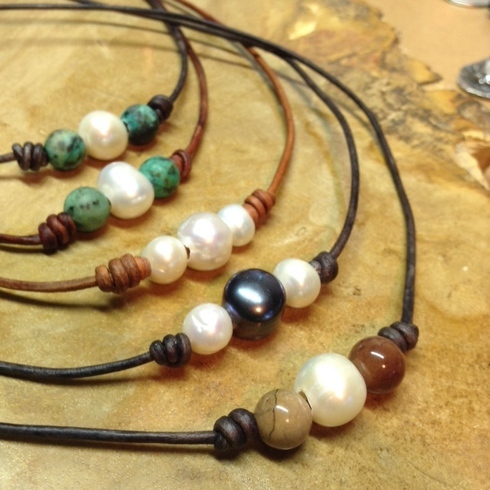 Have you tried leather with your pearls?Pearls are the oceans gift to women. The mollusks from around the world give up these precious gems in colors and textures to fit any outfit, mood or task. Treasured for generations and spawning trade around the world, pearls are a language we all understand. Pearls provide a sense of beauty, class, adventure, meaning and kinship. That last thing is the one that gets me the most. My Momma was famous for wearing her pearls in our neighborhood. Daddy gave them to her way before us kids came around. She let me wear them once, to the prom. For me, there is sentiment and kinship in pearls not found with other gems. When I design a new piece of jewelry or assemble a piece that is already available on my website, I always think about the elegance and grace of these women. My Momma is gone now, but when I handle pearls, I feel her presence. Be sure to always lay your pearls flat when you take them off so they don't stretch. Restring your pearls annually, if you wear them daily. Cleaning with anything other than mild soapy water and a wet cloth is likely to damage the luster of your pearls. There are some commercially available pearl cleaners out there, but stick with mild soap and water, its what your momma used. Hairspray, perfume, makeup and acidic foods on your fingers will cause discoloration and can really damage the pearls' luster. Remember, these were once living organisms so acids will eat into them if you are not careful. And did you know the oil from your skin is good for pearl jewelry? Pearls are organic, and as such, need moisture. Pearls also soak up oils from the skin which will add to their luster, making it deeper over time and keeping their value as an everyday part of your wardrobe. I have a friend, Maura, who got me going back to Pearls. She spends half the year running a B&B on Cayuga Lake, NY and half the year sailing the blue oceans of the Caribbean. Two vastly different venues. You won't find her without her pearls. Ever. Cooking, cleaning, working the garden (where this amazing chef grows nearly everything she uses for cooking). On land, on the water, in the water, whatever she wears, the pearls go on first. 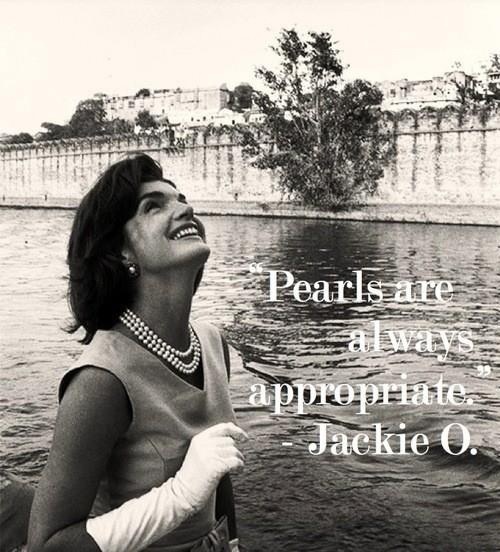 And they did it all in Pearls. So can you in 2016! I am busy working on several new pieces. Needless to say, a favorite I have right now is combining fresh water pearls with Limpet shells from Sanibel Island, FL. When I found these limpets on the beach at Sanibel, I knew the blues inside the limpet shell would cast a remarkable hew over the pearls. This is a necklace named after a little girl who stole my heart. Her name is Ireland and her mommy works at the Pop Gallery in Disney Springs where some of my creations are sold. I can't walk down the street with out someone stopping to ask where I got that necklace and earrings. Several times I have sold them right off my neck after I tell them who I am, that I collected the shells, hand-picked the pearls and assembled them myself at my studio in Crofton, Maryland. Jewelry Design is a very creative endeavor. With pearl jewelry in particular, I try to make things that can be worn everyday by women of all ages. I have the standards, of course, but I am also stocked with leather and pearl bracelets and necklaces that go with anything for any size woman. I exclusively use sterling silver chains and wires on my earrings because they are the best. My Pearl Earrings come in all kinds of shapes and sizes and often feature special handmade touches also done in sterling silver. This Fall's collection is about ready and will feature the limpets and pearls along with a few surprises for buyers of all ages, even men!. If you are buying for younger woman, there is no time like the present to get them started with pearls. History says you should. Dressing up for a night out or heading to the beach for the day? My jewelry creations are clearly "Not Your Momma's Pearls". I think she would be proud. And I would be proud to have you wear something I made. Need to buy for someone special and have an idea for a custom commissioned piece, I do those too.